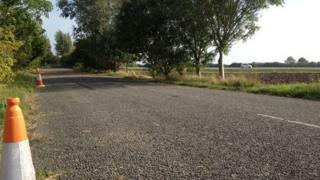 Residents of a Lincolnshire village have said they are worried an illegal traveller camp could be made permanent. A meeting in Stickford on Tuesday night attended by more than 100 people heard claims of anti-social behaviour of some travellers on Hagenby Road. East Lindsey District Council admitted a site was needed in the area but insisted no decisions had been made. A spokesman for the traveller community said many allegations were hearsay and permanent sites were needed. The meeting heard complaints that the site on Hagenby Road, near the A16, had been used illegally for two years and had seen vandalism, footpaths used as toilets and fly-tipping. Victoria Ayling, the UKIP councillor for Spilsby Fen, who lives in Stickford, said it was not acceptable that residents were being left to worry. "We have been informed there could be 20 designated stopover places down the A16 in East Lindsey, and two permanent sites. "But no one knows where they are going, we can't get any information indicating where they are going . "This secrecy leads to rumour, which leads to uncertainty and fear." Joseph Jones, from the Gypsy Council, said: "There are bad elements in any group, and illegal or anti-social behaviour should be reported to police. "But if it became a permanent site you would not get people using public places as toilets because toilets would be provided." Craig Leyland, responsible for East Lindsey District Council's plan for traveller sites, said a report had indentified the need for three transit sites in Mablethorpe, Skegness and somewhere along the A16 from Boston to Spilsby. He added: "We are nowhere near making a decision but we have a legal obligation to provide some sites. "The views were made very clear at the meeting but I must reiterate a full consultation will be carried out before any decisions are made."